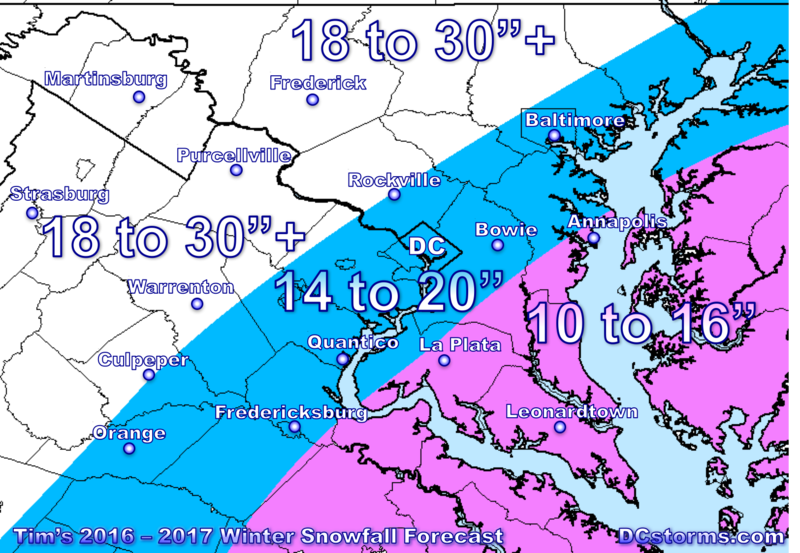 After one of the longest lasting Summers that I can remember here in the Washington Area and Autumn finally upon us it is that time of year for me to issue my 2016-2017 Winter Forecast. I am going to admit right away that I have low-confidence in my winter forecast this year as many of the climatic factors this season that one would look at while choosing historic analogs are “weak” at best. For example, while we currently have weak La Nina conditions across the Pacific, most of the forecast models (image below) further weaken the La Nina as we head deeper into the upcoming winter. Therefore some of the drivers that we would experience in a typical weak La Nina winter will not necessarily continue through late January into March. Secondly the Warm Phase of the PDO (the abnormally warm water that has been parked off of the Alaskan, Canadian and West coast of the United States) has also been weakening a bit. Will this trend continue? Will the water temperatures continue to cool breaking down a western ridge/eastern trough setup that we had through much of last winter? Notice that while we have a ‘large blob’ of abnormally warm water south of Alaska (indicative of that Warm Phase of the PDO), some cooler water is beginning to show up in spots across the western coast of the United States. Still, the Warm PDO could hold long enough to help park a strong ridge of high pressure over Alaska which would help to push Arctic air masses into the Eastern United States during the upcoming winter. Thirdly, while Siberian snowfall (shades of blue in image below are indicative of above average snowfall in October 2016) is off to a healthy start, i wouldn’t argue that it is “well above normal”. Siberian snowfall anomalies in October can be an indicator of a negative Arctic Oscillation during an upcoming Winter Season. When the AO (Arctic Oscillation) is in its negative phase, the Polar Vortex is weakened unleashing arctic air into the mid-latitudes from the polar regions. The image above shows sunspot activity over the past 15 years (Image courtesy NOAA/SWPC). You can see that since the most recent peak in 2014, the sunspot activity has been quieting down and this can have a huge impact on driving down Global temperatures, especially for the hemisphere experiencing winter. I pulled weak La Nina winters where the PDO was in its warm phase. I expect that this Winter will definitely be remembered as “COLD” across much of the the Midwest, interior New England, and northern Mid-Atlantic states with a heightened probability of arctic intrusions. The image below shows the 500 mb anomaly chart (based on the analog years I chose). A ridge of high pressure can be seen over Alaska and the west coast with a trough entrenched firmly over the eastern two-thirds of the nation. Surface Temperatures based upon the upper level pattern (image above) would indicate slightly colder than average temperatures expected across the Mid-Atlantic (image below), with brutally cold conditions across the upper midwest! A more detailed look at the United States (Temperature and Precipitation anomalies) shows cooler than average conditions expected across the Washington Region with precipitation near average. How much Snow fell during these analog years? As you can see from the analogs in the chart above, some years featured well above normal snowfall at Washington National airport (remember the blizzard of 1996?) with others producing well-below average seasonal totals. The majority though produced average to well above average snowfall. The variance in the data is likely due to the behaviors of the North-Atlantic-Oscillation (NAO) and storm track. Other factors this winter include very warm water parked off of the northeastern United States coastline and this bodes well for east coast storms to rapidly deepen. The million dollar question will be when do these systems phase? Off our coast bringing snow to DC or north of us hammering New England? If the NAO and AO can remain in their negative phase long enough, then we have an increased chance of a decent Nor’easter around the DC Area. What we will be lacking this Winter is an extremely active southern branch of the jet stream that is typically featured during El Nino winters. This means that the jet stream this winter will likely be split into two branches (a stronger northern branch and a weaker southern branch). Again I would like to drive home just how cold this winter may turn out to be as we look at December through March temperature anomalies. Remember this is just a forecast and not set in stone. A number of things could change and bust my entire forecast. December temperature anomalies: Unlike last year, winter may actually get going a bit faster with some cold conditions expected in December and maybe our first accumulating snowfall. March Temperature anomalies: Bitter Cold across the entire Mid-Atlantic, New England and Midwest! Will we have a slow start to spring? The analogs are certainly suggesting just that. 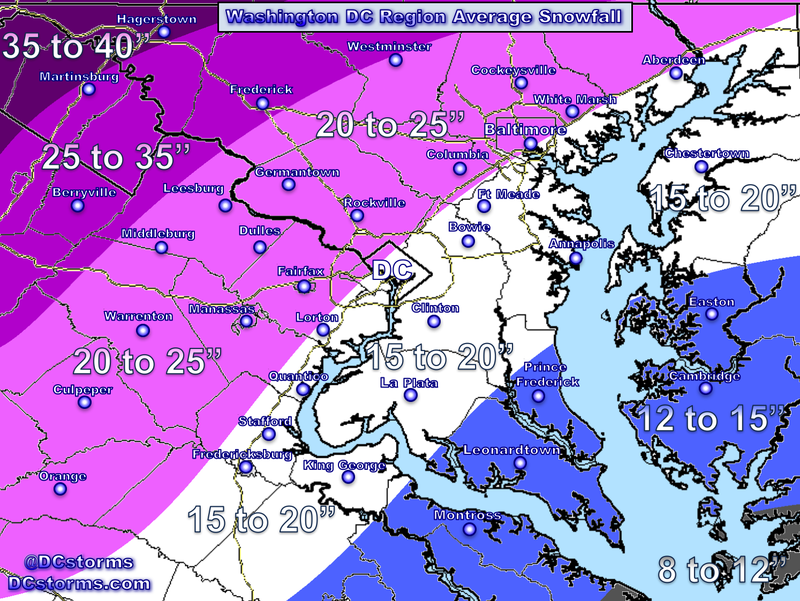 Temperatures this winter will likely run slightly to well below average across the Washington Region. Precipitation looks to remain near average in the Washington Region. Snowfall will be highly dependent upon when disturbances phase along the Mid-Atlantic coastline. While 2016-2017 will likely be remembered as cold in our region, I am being more conservative in the snowfall forecast as I remember several weak La Nina years where Nor’easters slammed Philadelphia and New York missing our region. I also don’t recall seeing two massive blizzards in a row in subsequent winter seasons (Blizzard of January 2016 being our latest)… so I’m more of a probability type of guy where I’d be shocked to have another storm of that magnitude this year. This doesn’t mean that it won’t happen, I’m just basing my forecast on probability. So there you have it, if you have any questions, feel free to ask away. This will be a very interesting winter as again, many of the climatic factors that we look at are very weak or more subtle this winter season. Next Post Temperature Roller Coaster this week, Possible Weekend Nor’easter? Bill, Winter Forecasts are extremely difficult as predicting the weather out past a few weeks is a tough enough challenge. 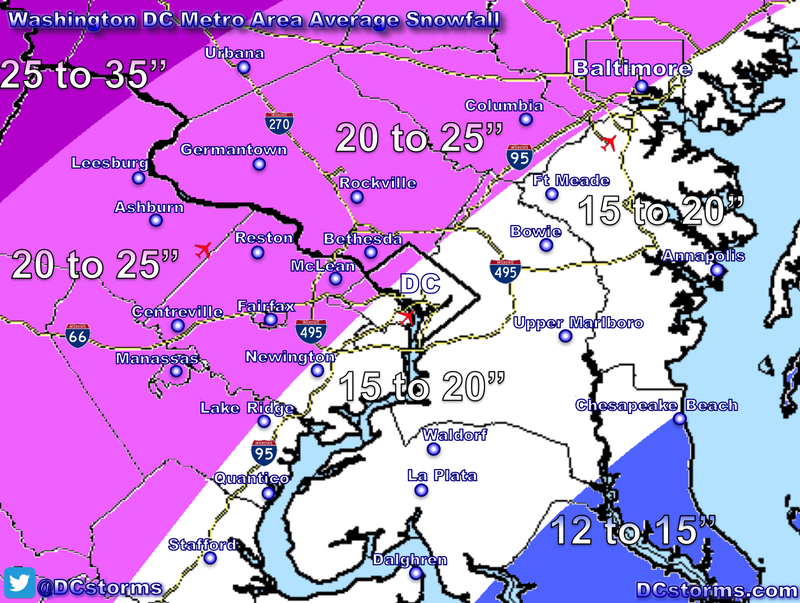 Last year only 3″ fell in DC with more than double that in the northern and western suburbs. The analog package I chose suggested near normal to slightly above normal snowfall but in the world of attempting to make a seasonal forecast, the outcomes are only as good as choosing the correct analogs… difficult at best. I’m curious. How did your last year’s forecast compare to what actually happened? I look forward to your Winter forecasts every year. Interesting report Tim. Would love some days off because of the cold!! Last winter wasn’t very tough in my opinion because of the moderate El Nino. Because this winter may head into neutral ENSO (La Nina may weaken completely to neutral conditions), and a weakening PDO and a positive QBO… how the split jet stream behaves and interacts with the AO and NAO will determine if we get the moisture we need meeting up with cold air. I have seen dry, cold winters around here and it is the precipitation that I am worried about, not the absence of “cold air”. Would we have record cold again like 2 years ago? Looks like the only way we would get sufficient snow is if clippers deepened as they aproached our area. Do you think this winter is even tougher than last winter to forecast?